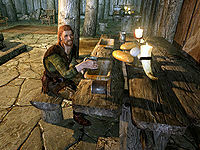 Mralki is a Nord food vendor living in Rorikstead. He is the owner of the Frostfruit Inn, and the father of Erik. He can be found behind the counter of his inn at all times, never stopping to eat or sleep. He will rent rooms out and barter with any potential customers at any time. Mralki wears a set of barkeep clothes and a pair of shoes. He is equipped with an iron dagger, and carries a selection of common items and gold. He will greet you warmly with: "If you need a meal or a room, I've got both." but he will soon tell you: "I only take real coin here, no handouts and no bartering." He will also give you a bit of advice concerning the local residents should you ask him where you can learn about magic: "Bit of advice, folks here don't care for magic or those that use it. If you're intent on it, check at the College up in Winterhold. Either that or go see the Jarl's court wizard." He is opposed to the idea of his son becoming an adventurer, much to Erik's dismay. This is mostly due to the fact that his son has little experience of the outside world: "That fool son of mine, Erik, wants to be an adventurer. He [sic] a good-natured lad, but he's got no idea how dangerous the world really is." This has not gone unnoticed by the local residents and even Mralki himself will say: "Some folk here will tell you I'm sheltering my boy too much, but I ask you, isn't it a father's duty to keep his children safe?" Mralki: "Your daughters are growing up fast, Lemkil. Seems like only yesterday they were newborn babes." Lemkil: "They've grown, all right - lazier and more stupid." Mralki: "There's times I think you're the coldest man in Skyrim. This is your own flesh and blood you're talking about." "I want to be an adventurer like you, but my father says I can't." Should you talk to Erik, he will discuss his father's past life as a soldier with you: "My father, Mralki, manages the inn. He used to be a soldier, but he left that life behind." 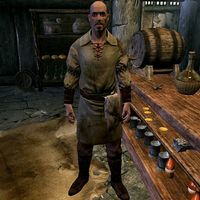 When you ask him if he has lived in Rorikstead all of his life, he will tell you how Mralki went from being a soldier to an innkeeper: "My father was a soldier. He fought in the great war and when it was over, he retired here to raise a family. My mother passed away when I was just a babe, so he did his best to raise me on his own." He will quickly reveal to you that he wishes to follow in his father's footsteps to an extent, beginning with a question: "You look like you've seen your share of adventure. I envy you that. In fact, maybe you can help me with something. Will you hear me out?" If you hear him out, he will tell you that he wants to become an adventurer: "I want to be an adventurer like you, but my father says I can't. He says that he needs me to stay here and work the farm, and even if he did let me be an adventurer, we couldn't afford to buy armor. His name's Mralki, and he's the innkeeper here. I hope you can change his mind." You should let your son choose the life he wants. "But the world is a dangerous place. Erik has no idea what he's getting himself into." Your days of exploiting your son are over. "Exploiting? What's that supposed to mean? Erik works the farm because he's a good lad! I'm not forcing him to stay here. I know that he wants a life of adventure, but I've told him before that I can't afford to buy him armor." Here, use this to buy some armor. (Bribe) Passed: "You would give your own coin to help my son? I'm moved by your compassion. Your kind deed will not go unrewarded, my friend. Tell Erik I've changed my mind, and we'll visit Whiterun soon to fit him for armor." Failed: "I appreciate the gesture, but I'd rather not be in debt to a stranger." You'd prefer your son to grow bitter and resent you? (Persuade) Passed: "I... I cannot deny the truth of what you say. Erik is all the family that I have left, but it's wrong to hold him back as I have. Go and tell Erik that I've changed my mind. I'll see about borrowing some money in Whiterun for his armor." Failed: "Perhaps you should let a father decide what is best for his own son." Find the money, or you'll have me to deal with. (Intimidate) Passed: "Ah, I see. I've just remembered that I saved a few septims in case of an emergency. This is starting to feel like one. Tell Erik that I've changed my mind, and we'll visit Whiterun soon to fit him for armor. And please don't hurt me!" Failed: "Go ahead, hit me as often as you want. It's not going to change anything, other than to make me and the town guard angry." Once you have successfully persuaded Mralki to buy armor for Erik, you can return to him and tell him that his father changed his mind. This will cause the overjoyed Erik to begin his new, exciting life and become Erik the Slayer. You can question him about the name, which will have him reveal that Mralki had suggested some alternative names: '"Father says I should pick a name that describes what I really am, but nobody's going to hire Erik Greenthumb or Erik Hoe-pusher. No, I need a name that will put some fear in the hearts of my enemies. When I have some enemies, that is." He mentions a chest located "downstairs" in one of his conversations with Erik, but the inn does not have a basement. This page was last modified on 23 October 2018, at 10:36.